This is a post from last New Year's Eve that I wanted to share again. So many of you are new to blogging this year, and maybe hadn't seen it. It's one of my favorite vignettes. I had been wanting to do a cupboard with just silver and neutrals and decided to put this together the week after Christmas. Odds and ends and clock faces and silver. I enjoyed it until the Valentine's bug bit me in mid January. Love the seasons and holidays...keeps things interesting, and in somewhat of a disarray. This is on my sideboard in the Hall kitchen, which gets changed out regularly. I like to clear things off and start fresh each month. I wanted some New Year's Eve sparkle! Just look at the patina on this old metal painted vanity mirrored tray. Love this old wedding certificate. I haven't been able to get a lot accomplished this week, I'm taking it easy on the ankle. Thanks so much for all your well wishes and kind words. I still have some Christmas decor that needs to be put away... I'm ready for a fresh start for 2012. Thank you, each one of you, who comes by to visit. You're my inspiration, and my motivation to stay busy and focused. Non bloggers may not understand us, but we know the friendship and "community" are real. I think of you each as a blessing. is still going strong, click here. I love your vignettes, and yes I am fairly new to blogging so I am not seen it before....I also love the sparkle effect! P.S. : Thanks for stopping by and Happy New Year 2012! Lovely, I am truly inspired by your added sparkle! So Lovely and Fresh Debra! Just Beautiful! Happy New Year My Friend! May it bring you Many Blessings. Debra! Stunning! I bet it's even more gorgeous in person. Love everything you've done here. Your home looks beautiful. Happy New Year! Lovely vignette! Wishing you a happy new year and hope your ankle heals quickly! I love all the white, silver and mirror. I like that you still have the little trees out too. I have been thinking about leaving some of my winter decor out, it is a long winter here and I need something besides valentines up. Happy New Year. I love all your silver. It looks fabulous!Hope you feel better soon.Happy New Year. Stay off the ankle and relax this weekend...well wishes for you. I remember this post! I enjoyed seeing it again! that is just yummy on so many levels! Happy New Year! Your silver vignette is beautiful. I put away my Christmas decorations and changed out my entertainment center. I now have a few of my silver collection as decoration on the top. Lovely!! The clock faces are wonderful! Hoping 2012 is good to you and yours! I think it's one of my favorite vignettes of yours Debra. Love it. Happy New Year! What a gorgeous vignette! I am tearing down my Christmas decor this weekend and am a bit at a loss as to what to do next. Your display is just lovely. I cannot let the year get by without telling you the joy its been sharing with you all that we inspire. You inspire a New Year to come 2012 in the best way it can I am sure of it. I love the display on your sideboard. Just gorgeous how you have arranged all your beautiful pieces of silver. Hope you have a blessed 2012! Gorgeous vignette and the silver is elegantly displayed!!! I agree that the friendships and "community" are a constant source of inspiration, motivation and support. Take good care of that ankle! Happy New Year! Your silver and sparkle are beautiful! Happy New Year! Beautiful Debra! I need to make some of the clock faces. I don't ever see them for sale. I love the marriage certificate! 20 years ago IL still used it. That is the same marriage certificate my hubs and I have and it is hanging in the bedroom. You make beautiful vignettes! Have a wonderful New Year and get well soon! Debra, I love your sideboard vignette. The colors and textures are lovely and sooo interesting. 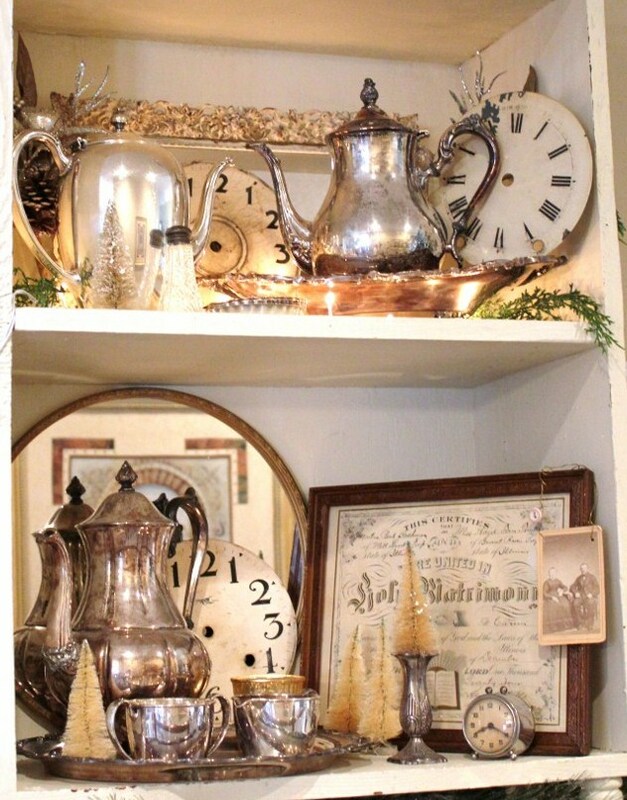 Love your silver pieces and little bottle brush trees, and the clocks are just perfect for the new year. Thanks for hosting and I hope your ankle will be better soon. Hi Debra, I loved catching up on all the post that I missed from only being on a bit.... 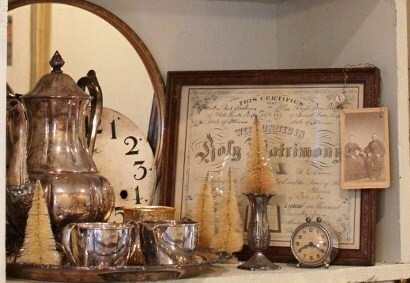 I love seeing the Beautiful Vignettes & the Sweet word, also sorry about your ankle, hope your up & about real soon~ Happy New Year to You, I am counting on many Blessings & an Awesome year ~ Here's to 2012! Hi Debra, I just want to wish you the most wonderful New Year in 2012! I love all the silver, the clock faces, the wedding certificate and the trees. It's such a gorgeous vignette, Debra! Couldn't let the New Year come in and not drop by to wish you a very happy twenty twelve! Many blessings to you from your number one fan in Texas! Stunning! You have such a way with display. I have so enjoyed your posts over this past year. Happy New Year! I absolutely LOVE your vignettes Debra!! Beautiful! Makes me want to do something along those lines. I must have missed the post about your ankle, but I do hope you are doing better each day! Glad to hear you are resting Debra! Love this sparkling post with all the clock faces ~ gives me lots of pins! Happy new year! Such a pretty vignette! I love the little touches like the bottle brush trees, cabinet cards/photos and the mercury glass. Gorgeous! Debra, Happy New Year to you and your family! Such a gorgeous vignette. Love all of the clock faces and silver. Hope you ankle is feeling better soon! I think this is sooo gorgeous. I totally loved my visit with you today! Such a wonderful vignette, lovely colours! I'm always a fan of your posts! Doesn't matter if I've seen 'em or not, I still love them all! I hope you had a wonderful holiday and the New Year finds you peaceful and content. I ♥ tarnished silver with tea stained pretties. Your stuff looks great!! And what kind words to all of us, I wish I had your gift for writing. Thank you for sharing this post again. I DO remember it from last year....because it was so beautiful. Hope your ankle is mending well.